The Smell of Fall is in the Air……. Right now the signs of Fall are everywhere with kids going back to school, leaves changing colors and littering the lawns and sidewalks, cooler mornings, and shorter days we know that certain seasonal treats are right around the corner. I have already heard of several people running to Starbucks to get their first Pumpkin Pie Latte’ of the season! Other treats that are on the horizon are caramel and candied apples, pumpkin pie scones, hot apple cider, and caramel corn. Honestly I’ve never really been a fan of caramel corn; it has just never really done anything for me. Right around mid-September to early October my mom used to make a turkey roaster full of caramel corn. It really seemed like a long drawn out process, and while everyone else raved about it, I was never really impressed. There was just something about the flavor that didn’t bring fireworks to my taste buds urging me to grab another handful. Like I said though, everyone else thought it was wonderful, so maybe it was just me. 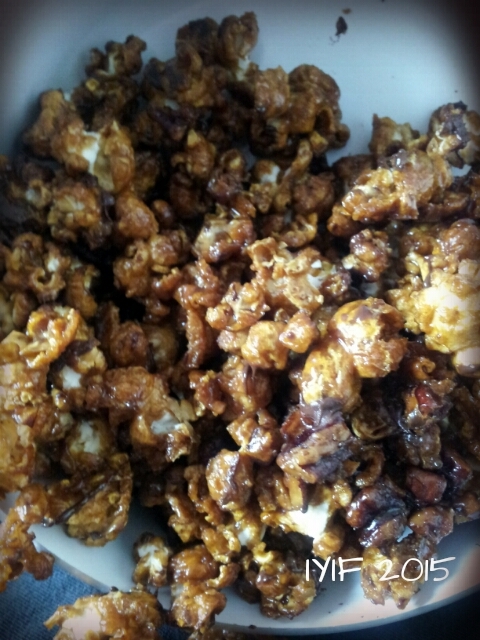 My husband likes caramel corn though, and while I had never made it until a week ago, and then again yesterday, I figured it was only fair that I try my hand at it and see if I couldn’t put a fun little twist on it, and bring down the sugar level. On average, plain caramel corn, without any added peanuts or chocolate, runs 100-150 calories with 14-17 g of sugar per ¾ to 1 cup. The calories, they are fine, but the sugar… wow! After figuring out how to make homemade nearly sugar free brown sugar, and with some studying realized that I didn’t even need corn syrup in a lot of recipes that call for it (Usually candy types of recipes) I was able to bring my caramel corn’s sugar down to 6 g per serving! 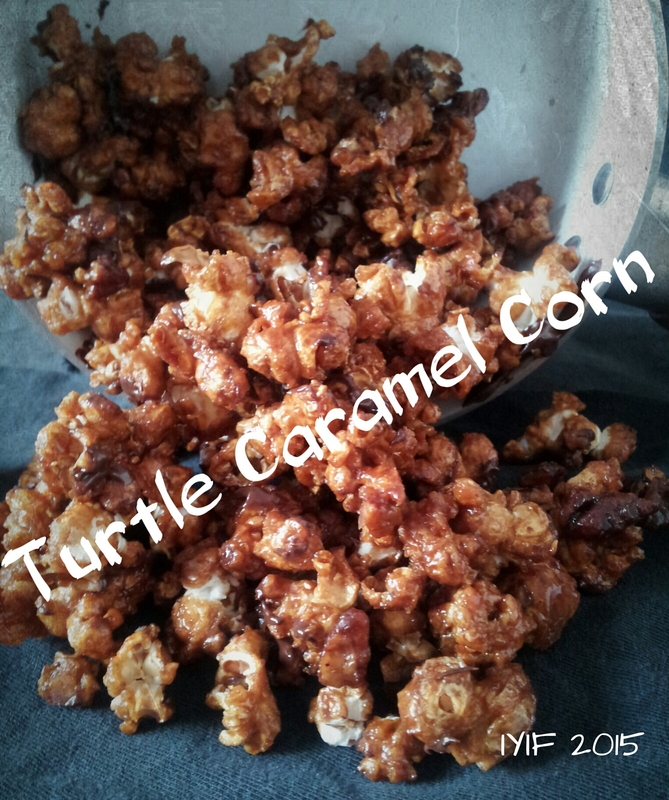 That includes the pecans and chocolate I drizzled over the top to make it “Turtle Caramel Corn”. (You could use sugar free chocolate chips and lower it a little more; I just didn’t have any on hand.) A serving is ¾-1 cup depending on how much your popcorn shrinks down as you cook it. The only way I can describe this stuff is that instead of sticking to your teeth and being super crunchy, it has a little crunch, but it basically just melts in your mouth. It literally dissolves as you eat it! One of the greatest things about this recipe is IT IS EASY! Once you make the caramel sauce and throw it in the oven you only have to check on it 4 times before you take it out. I popped my popcorn in a covered bowl in the microwave. (1/4 cup of kernels yields 4-5 cups). 2 minutes and 30 seconds usually does the trick without burning it, plastic bowl, loose lid, zap it, and done! And the caramel sauce doesn’t need a candy thermometer! Essentially you melt the Truvia, molasses, and butter in a pan (Make sure it’s a medium size pot, not a little sauce pan because when you add your cream of tartar and baking powder it will foam.) When it is all melted together and bubbly remove the pot from the heat while you stir in your cream of tartar (replacing the corn syrup) and baking powder and then place it back on the heat for about 2-3 minutes stirring constantly as it bubbles. Once the sauce is made dump your popcorn in and gently fold it over until all of the corn is coated with your caramel sauce, then stir in the pecans. Pour it on to a foil lined cookie sheet, spread it out a little, pop it in the oven, and stir it every 15 minutes for an hour. 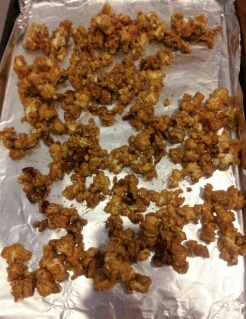 Once you remove the caramel corn from the oven it will still feel soggy, don’t worry, you did it right. 🙂 Let it sit for about 10 minutes, then dump it out onto some wax paper to cool. It will get crispier as it cools. After about 30 minutes melt your chocolate and drizzle it over the top. 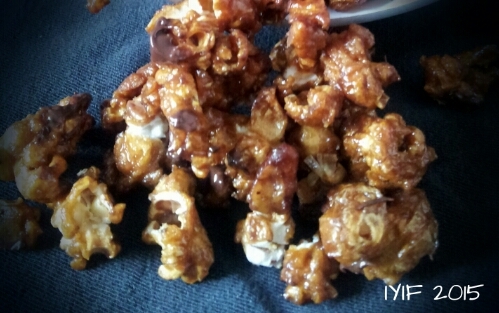 Let it just hang out on your counter for a few hours, the caramel corn will get crispy, and the chocolate will firm up, and you will be able to enjoy your masterpiece! Keep in mind that while this stuff is low in sugar it is super addictive. I’m warning you. 🙂 So, make sure that you have someone to share it with or it can just disappear right before your eyes! Introducing Indulge Your Inner Foodie!